IRDG would like to invite your business to contribute to a national survey which we are helping to facilitate by reaching out to our contacts across the country. The purpose of the survey is to gather views as to whether membership of certain International Research organisations is of value to Ireland. The results will be compiled and shared on a collective, anonymous basis back to the Dept. of Jobs, Enterprise and Employment. These organisations are diverse in nature, and all provide services or facilities of a scale which no one country could provide on its own. 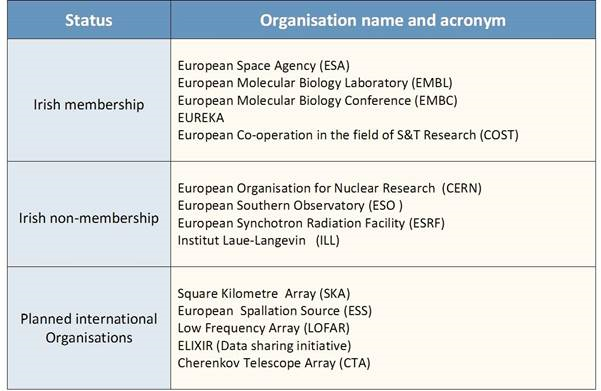 Some provide access to major items of equipment or data; whilst others facilitate joint research, data management or other forms of cooperation. CIRCA Group are leading the study on these organisations and you can give your input through the survey link HERE. Even if you have not had any contact with these organisations, your views would be useful. Their relevance to you could be in providing vital technical services in certain areas, in developing your networks for research or marketing, while some are potential customers for Irish products. Procurement, and access to technical and other services, is restricted to companies within member countries, so a decision on membership is important. Your views will be entirely confidential and only the overall view of respondents will be reported. There are 14 organisations involved (listed at the very bottom of this post) but only those of direct potential interest to industry are included in this survey. The survey will take you approximately 15 minutes to complete, and you can skip through sections if you have no interest / knowledge in that area.